At least 50 kilometers down the road from the Hungarian border with Austria, there were “Border Closed” signs in Hungarian and English. Cars and trucks were diverting through Slovakia to get to Austria. But I had been following a train with masses of refugees that had been toiling through the country toward the border. The train would have to cross to Austria or camp out at the train station that night. When my cameraman and I pulled into the border village in our car, the train was headed back toward Budapest, and at the village train station, I saw police organizing a march on foot to the border. The line of about 100 people was quiet and some held their heads down, almost like prisoners. A few men smoked as they walked. Three volunteers quickly and quietly passed out bananas, water bottles and snacks as they passed. Monaf, the 20-year-old Syrian college student who was the reason I was following the train, later told me that the trip was exhausting, with 70 people packed into cars meant for 30. On the other hand, the train ride was free, and after paying to go from Syria, where I first met him, to Lebanon to Turkey, Greece, Macedonia, Serbia and now through Hungary to Austria, he said, he did not mind saving money. Late Monday, he and his five friends reached Vienna. After risking their lives, leaving their families, and sleeping in parks and streets throughout the dangerous journey, Vienna was a relief. It was the first country where Monaf didn't fear being arrested, attacked, deported or locked into refugee camps. After he had been in Vienna for about a day, mostly inside a chaotic train station packed with refugees, I asked Monaf how he felt about Vienna now. “It’s very, very good,” he said in English. He usually spoke Arabic. This was a special occasion. Monaf and his friends still had no tickets to Germany, where many refugees believe they will find opportunities and safety. The station was packed with people, mostly from Afghanistan and Syria, and volunteers giving out meals, clothes and assistance. Translators had languages taped to their vests and carried handwritten signs, mostly in Arabic, Farsi or Kurdish. The only part of the station carefully controlled by police was an hours-long ticket line. The six men had all fled Syria. No matter what group of men with guns you support there, they said, there is another group that wants to kill you for it. Syrian, Afghan refugees dance outside Vienna, Austria train station, Sept. 15, 2015. There is a distrust between Syrian and Afghan refugees here in Vienna, with the two groups competing for resources and sharing no common language. But outside the train station on Tuesday evening, mistrust is forgotten as refugees dance to pass the time as they wait for days to get on trains. One member of the group danced in the streets with some of the refugees from Afghanistan. Monaf's group and I managed to get tickets to Berlin for the following day. 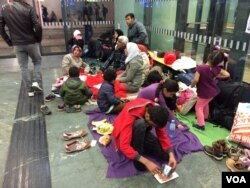 Early in the afternoon, as we waited, many refugees slept in the station halls. Police quietly escorted out scores without train tickets, presumably to bring them to government-provided dormitories. 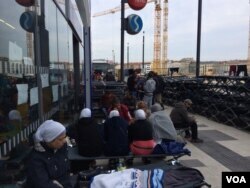 Outside the station were a few tents and blankets, where people preferred to sleep, rather than risk taking up Austria’s offer of free housing. The men discussed which of the “good” countries they wanted to settle in, possibly Germany, the Netherlands, Sweden, Norway or Belgium. Their dreams were close to coming true. “We can’t get on this train until we know for sure,” Ahmed said. "It's not worth it."